Dilijan is a city with an ancient history, mild climate, many holiday houses, guest houses, health resorts and tourist centers. On the left bank of the river is located resort area with wide choice of health resorts and holiday houses and resorts. Large wooded park of 40 hectares is used for hiking and outdoor activities. Every year, many travellers come to Dilijan to enjoy its natural and architectural monuments of antiquity, the mountains and the forests that surround you at any point in the city, as well as to relax, improve your health, breathe in the fresh mountain air and enjoy the crystal clear water from the natural springs. Because of the synthesis of natural and recreational components (clean air, mineral springs) Dilijan is the edge, which is famous for the treatment of pulmonary diseases. 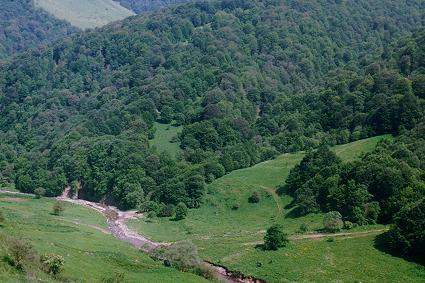 Dilijan (Region Tavush) is a city with a specific flora and fauna. Its vast territory is wooded valley basin Aghstev (inflow Kura) and two of its tributaries. Climate of neighborhoods of Dilijan is warm and moderately humid. The clean mountain air is filled with the healing scent of pines. Mountain climatic and balneological resort Dilijan is located at 1255-1510m. Summer is warm (average temperature in July is 19 ° C) and winter is mild (average temperature in January is -2 ° C). Dryness of air is particularly evident in winter and spring months. Relative air humidity is about 70%, the amount of precipitation is about 640 mm per year. The city center is located on the right bank of the Aghstev, possessing its residences and shops. There is also a restored historical building quarter with its characteristic architectural elements of Dilijan - attics, wooden balconies with carved railings, carved windows’ frames and doors. Here, in this quarter, traditional way of life of locals is being reconstructed: artisans work in workshops, souvenirs shops and cafes and restaurants can be found easily. Travellers from all over the world come to this beautiful city to enjoy its natural and architectural monuments of antiquity, unforgettable mountains and forests that surround you at any point in the city. There are 32 ancient monuments on the territory of Dilijan and its surroundings. The most significant are Haghartsin, Goshavank Djuhtakvank and Matosavank, which are the most valuable monuments of medieval Armenian architecture.